It’s time for some employment standards spring cleaning! 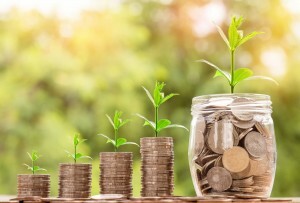 Effective April 1, 2019, the provincial minimum wage has increased in four Canadian provinces: New Brunswick, Newfoundland and Labrador, Nova Scotia, and Prince Edward Island. Employers in these provinces should be sure that payroll policies for minimum wage workers have been updated and that employees have been informed of their rights under the law. CPC has updated its unique line of Canadian All-On-One Labour Law posters to provide accurate information on the provincial minimum wage rates and other changes to employment standards. Poster updates are now available for employers who wish to keep employees informed of their statutory rights. Peel ‘N Post update stickers are only available for New Brunswick. 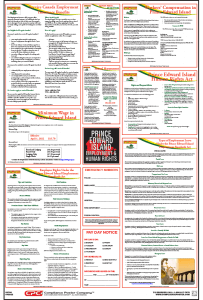 Due to additional changes, employers with locations in Newfoundland & Labrador, Nova Scotia, or Prince Edward Island must obtain a full poster. The Employee Leaves of Absence posting has been updated with new and expanded information on an employee’s right to take job-protected leave from employment for specified purposes. Parental Leave has increased from 35 weeks to 61 weeks. Adoption Leave has increased from 35 weeks to 61 weeks. Critical Illness Leave now includes the right to leave for the purposes of caring for a critically ill adult family member. Critically ill adult care leave consists of 17 weeks of unpaid leave while critically ill child care leave consists of 37 weeks of unpaid leave. Family Violence Leave is a new type of employment leave for an employee who has been the victim of family violence or who is a caregiver for a victim of family violence. Family violence leave consists of up to 3 days paid leave and 7 days unpaid leave to obtain health services, police or social services, or legal services. The posting also includes revised information on written notice requirements for employees who plan to take and return from leave and job protection requirements for when an employee returns from leave. Pregnancy and Parental Leave have increased so that an employee may take up to 16 weeks of pregnancy leave combined with 61 weeks of parental leave for a total of 77 weeks. An employee who has not given birth may take up to 77 weeks of parental leave. Critically Ill Adult Care Leave is a new type of employment leave for an employee who must care for an adult (aged 18 or more) family member or person who is like family. Critically ill adult care leave consists of up to 16 weeks of unpaid leave. Domestic Violence Leave is a new type of employment leave for an employee who has been the victim of domestic violence or whose child (under age 18) has been a victim of domestic violence. Domestic violence leave may consist of up to 10 intermittent or consecutive days of leave and up to 16 weeks per year. Up to 3 days of leave must be paid by the employer. On the sectioned companion poster, text has been added which states that an employer is required to post a current phone number for reporting health and safety concerns to the Occupational Health and Safety Division. The Types of Employment Leave posting has been updated with new and expanded information on an employee’s right to take job-protected leave from employment for specified purposes. Sick Leave qualification period has been reduced from 6 months to 3 months. Parental Leave and Adoption Leave has increased from 35 weeks to 62 weeks. The combined aggregate for maternity and parental leave has increased from 52 weeks to 78 weeks. Compassionate Care Leave has increased from 8 weeks to 28 weeks. The sectioned companion poster has been updated with revised information on requirements for a Workplace Violence Policy and Sexual Harassment Policy. WHY DISPLAY 2019 CANADIAN LABOUR LAW POSTERS? Unlike the United States, Canada usually does not require employers to display general informational notices about employment standards. Instead, employers may be required to post the full text of specified provincial laws and regulations as well as employer-specific information, such as the names of workplace safety representatives or internal policies regarding topics such as workplace violence and harassment. However, many employers prefer to display additional descriptive notices to ensure that employees are fully informed of their rights and responsibilities under the law without having to wade through pages of legal text. For those employers, CPC has created our unique line of Canadian All-On-One™ Labour Law Posters. 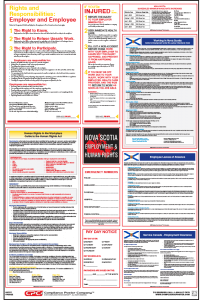 Each poster contains informational notices on various aspects of provincial employment law, such as requirements surrounding payment of wages, the types of leave employees are entitled to, prohibited forms of discrimination, and occupational safety and health. 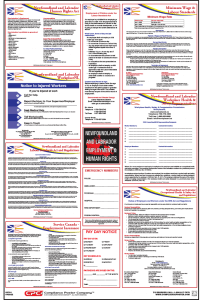 Every 2019 Canadian Labour Law Poster comes with a sectioned companion poster to allow employers to post the copies of laws, regulations, and internal policies which are required by provincial law. To keep up with the latest in federal, state, and local labor law news and posting compliance for the U.S. and Canada, follow us on Facebook, LinkedIn, or Twitter or subscribe to this blog! You can also contact us by phone, via email, or by chat to order one of CPC’s signature labor law compliance products or learn more about posting obligations.